Cannons & Stock Exchanges | SPACE-BIFF! Every now and then, there’s a very small game with a heart that pumps very big ideas. Guns & Steel is tiny. Not quite an appetizer since it usually clocks in at over an hour, but it’s a slender thing, only about fifty cards or so. And while the rules can be a little tricky to learn, that’s largely because it’s doing so much with so little. Each and every card, for instance, works double-duty as both resource and action, purchasing power and purchased opportunity. Once everything clicks, it slides from one beat to another as smoothly as a machine-tooled piston. But that’s not the main thing that’s got me so impressed. The progress of humanity from then to now. Before we get into Guns & Steel’s primary accomplishment, let’s talk about how it works. Laid out in front of you is a pyramid of technologies. The bottom level is basic roots-of-civilization stuff, currency and caravans and philosophy. Each rung above that gets more advanced, and as technologies move from engineering to steam engines and guilds to stock exchanges, they also represent new resources, entirely inconceivable to the people of earlier eras. You start with a hand packed with the most rudimentary of tech, mining and bartering and the first feeble attempts at organized killing with sharpened sticks, and the resources on display here are the fundamentals of early civilization, iron and food. Later on you’ll harness horses, gunpowder, oil, and more. The gameplay itself is straightforward enough: play a card onto its resource side and play another for its action. If you’ve stockpiled the right sorts of resources — or positioned yourself to trade up to them — then you might be able to buy something. After multiple rounds of this, you’ll gather your spent cards back into your hand, resulting in an enormous wad of options. And yes, having a hand of a dozen cards can slow the decision-making down to a crawl. But here’s where the game gets interesting. Mirroring the rise and fall of real-world civilizations, the game quickly becomes a subtle — or sometimes not-so-subtle — contest to come out on top of a technological arms race, where a single stumble can leave you in the dust. Consider the Agriculture card, one of the starting techs. This lets you flip a single card over to its food side, effectively letting you place two resources per turn rather than just one. Very cool, not to mention essential for anyone hoping to amass a healthy stockpile and nab better techs before their opposition can. Then again, it’s possible that Agriculture will become obsolete almost immediately, because surely someone will invent Domestication. This one lets them flip a food, just like Agriculture, but then also flip a horse. That might seem merely nice. A marginal improvement. But the very next tech level bumps it up a notch by having Irrigation flip three food and a horse. Now they’re doing more work than Agriculture and Domestication combined. The hands get a little crazy. This theme, of technology as a metamorphosing agent, completely remaking civilizations as they assimilate new techniques and resources and ideas, is the beating heart of Guns & Steel. It’s the Red Queen’s Race writ into an hour-long card game: “It takes all the running you can do to keep in the same place.” Want to get ahead? Run twice as fast. Play twice as smart. The concept applies to warfare too. There are a few elements to each attack card, usually how strong they are and whether they can be played as reactions to enemy attacks. Defeat at war in Guns & Steel basically means one of two things, either that the aggressor will flip some of your resources back to their depleted side or steal a wonder out from under you. Wonders are hard to acquire and give you a whole bunch of points, so you’ll probably want to protect your own and steal those that don’t belong to you. Enter those attack cards. Early on, they’re specialized and paltry. By the time you’re developing Tanks, Fighters, and Nuclear Submarines, it’s possible to entirely demolish a person’s carefully-laid plans with a single stroke. Or take a cannon to the nose of their Spinx, to employ an entirely false historical anecdote. One of the game’s smaller tableaux. However, the sense that it’s disproportionately easier to conquer than to build is just one of the reasons that Guns & Steel will appeal to some folks more as an idea than as a game. 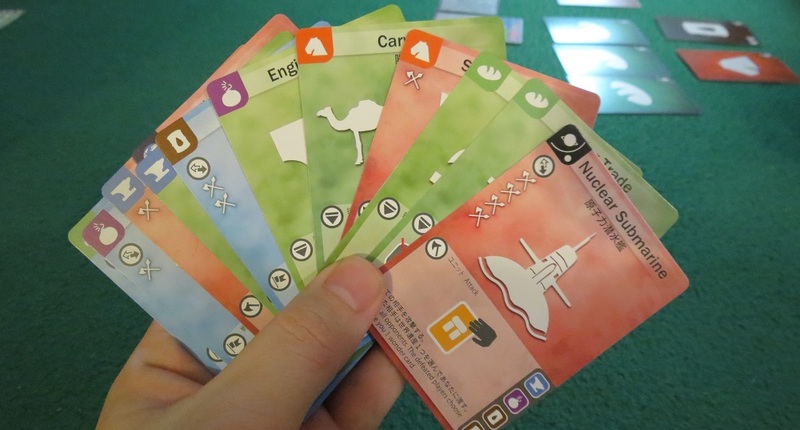 While it’s accurate that once-powerful nations have been left behind as their fellows developed improved methods of killing, it isn’t necessarily fun to act out the part of history’s losers while your friends pick up cool cards turn after turn, only pausing to exterminate what few resources you’ve managed to hoard. I love how unmerciful it is to those who can’t keep up; some won’t. This is also one of those games where its slimness occasionally feels like emaciation. It’s a fantastic concept, but after only a handful of plays I can already feel myself growing tired of seeing the same technologies and wonders appearing in the same sequence. With three or four players, every single development card appears in every game, with each wonder appearing roughly half the time. Being able to say that your card game captures the sweep of human technological progress in only fifty cards is pretty rad. I’d rather be able to report it can be played fifty times. In any case, Guns & Steel has a lot going for it. As with history, that praise will be written by the victors. 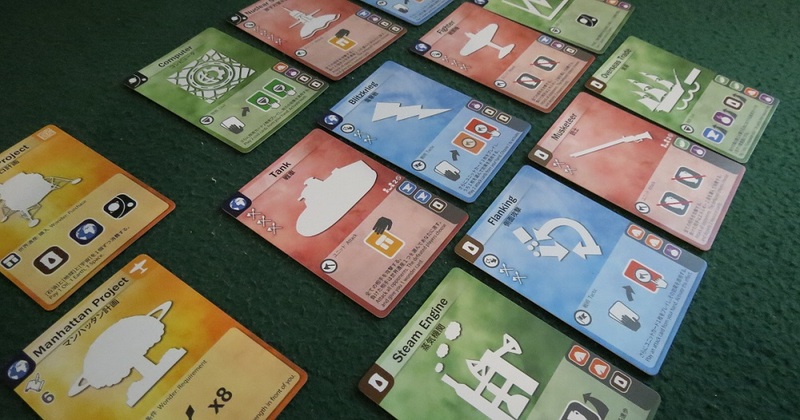 Posted on August 16, 2015, in Board Game and tagged Board Games, Guns & Steel, Moaideas Game Design. Bookmark the permalink. 4 Comments. Cannon shot can’t melt Egyptian limestone.